The Confederation of African Football has expressed its "deep sorrow" after at least 15 people were killed in a stampede at a match in DR Congo. The trouble occurred at a Congolese league match between AS Vita Club and TP Mazembe at the Tata Raphael Stadium in the capital Kinshasa on Sunday. Caf president Issa Hayatou said: "I would like to express my deepest sympathy over the untimely deaths. "I wish to re-emphasise that any acts of violence have no place in football." He added: "The violence must be condemned in the strongest possible terms. "I urge Fecofa (the Congolese football federation) and authorities in the DRC to thoroughly investigate this matter and ensure that measures put in place to avoid a repeat of any incidents are fully briefed with Caf and forestall any such occurrence." Local fans were unhappy after the home team, AS Vita Club, were defeated 1-0 by their rivals from Lubumbashi. Caf said the stampede caused a wall and gate to collapse with reports saying the trouble began in injury time when some AS Vita supporters threw missiles on to the pitch and the police responded by firing tear gas into the crowd. In addition to the fatalities, more than 20 people were injured. Hayatou said: "Personally, and on behalf of the members of the African football community, I should be grateful if you could extend our deepest condolences to their families, friends and loved ones. "Further, we wish those that have been reported injured and receiving medical assistance full recovery." 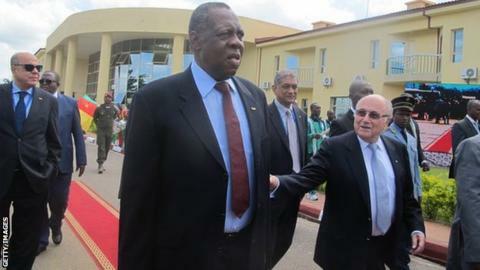 Fifa president Sepp Blatter said on Twitter: "Waiting for more news from DR Congo too after tragic reports. My thoughts are with all those who saw loved ones go to a game, not to return." The two teams are due to play each other in the African Champions League on the weekend of 24/25 May and Caf have said it will assess the security measures needed for the game in Lubumbashi to go ahead without incident. Caf director of communication Junior Binyam told BBC Sport: "There is time to come up with a decision about whether this game - or the return match in Kinshasa - might be played behind closed doors. "But now is not the right time to decide, so soon after the incident. We need to assess the situation and look at the reports first and then we will take a decision to ensure that security in Caf competitions is maintained. "A decision will be taken as soon as possible but not in a hurry."